Directions : Study the following information carefully and answer the questions given beside. 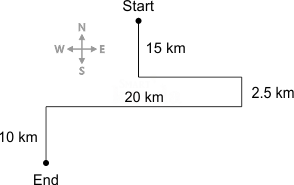 What is the total distance that Ankita travelled from the starting point till the 6th signal? 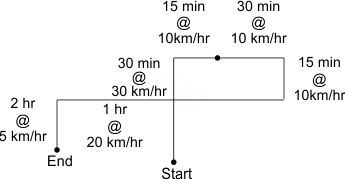 What is the average speed at which Ankita travelled from the starting point till the 6th signal? Suppose, in park there is no signals then how much less time Ankita would have taken to reach the final position? If at the starting point, Ankita was facing toward south then what would be the final position from the starting point? After the starting point, if the first signal was RG and RYG instead of RY and YG then what would be the final position of Ankita from the starting point? Data Interpretation is an important part in all bank exams. 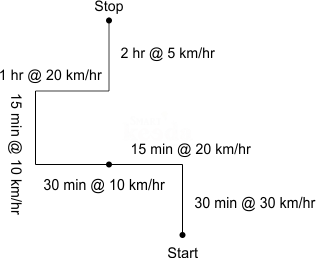 Here we at Smartkeeda.com we will learn a New Pattern Based DI, Which is Called Caselet DI, These days Caselet DI freequenty asked in all major Bank exams SBI PO Pre, SBI Clerk. It has alot chance to appear in SBI PO 2019 and SBI Clerk 2019. We provide you data interpretation quiz with answers and explanation. Aspirants preparing for SBI PO exams for the year 2019 can practice these questions. Let us now understand, what exactly is a Caselet DI. Data interpretation normally consists of questions involving pie charts, bar graphs, line graphs, radar graphs pr table with the required information for solving the questions. In a paragraph type data interpretation question, a set of information is provided in a paragraph form. It doesn’t consist of any charts or tables. You have to read the given information carefully and draw a suitable table/chart listing out all the given data to answer the questions. How to solve caselets/paragraph/Info Chart data interpretation questions? Given Below steps will help you all while solving questions of Caselet or paragraph based Data Interpretation questions in SBI PO, SBI Clerk Exams. Data Interpretation for SBI PO Pre, SBI Clerk 2019 with PDF. I. While Solving caselet involves a thorough understanding of the subject matter of the passage given. Read the paragraph with utmost care and analyze what the question demands. Basically be clear on what is given and what is asked. II. Try to underline all the important points in a caselet while reading it. You can always use symbols in place of names of persons, places etc to make your work a lot easier. Focus only on useful data and don’t do unnecessary approximations just to simplify the task. III. With all the important information in your hand, try to represent the data in graphical or tabular form. Represent the data in a pie chart, bar graph, table etc depending upon the feasibility and the motive of the question. IV. Read the figures closely. You can use options and approximations to avoid tedious and lengthy calculations. If the question asks for relative values, there is no need for find the accurate values. Use approximation but never over-approximate. I. Improve your calculation speed: Caselets being calculation intensive, you have to be good with your calculations. Learn speed math techniques and practice them regularly. The more you practice the faster you become in calculations. After a considerable amount of practice, you can do the calculations in your mind. This is going to save a lot of your precious time in exam conditions. So build a intuitive number sense. II. Be thorough with the arithmetic related topics like percentages, interests, ratios and proportions as caselets are often based on these type of concepts. Otherwise you will face a lot off difficulty tackling these questions. Get the basics; understand the difference between growth and growth rate, average growth rate, cumulative average growth rate, market share by volume and market share revenue etc. III. Practice makes a man perfect. The more you practice these types of questions, the easier the questions will become. Practice questions will improve your speed and accuracy. While attempting these type of questions in exam, always try to choose the questions which will give you the answer with lesser effort, or you will end up spending a significant amount of time on lengthy calculations. 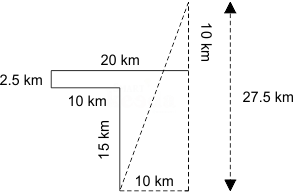 Caselet DI is frequently being asked these days and so we must practice this in the form of quizzes as Smartkeeda Caselt Data Interpretation Quiz for Free of Cost. So, Caselet DI is not new or not even out of way. It is just a mathematical form of English Passage. In Caselet DI, a long paragraph is given and on the basis of that. Candidates can download data interpretation quiz with solutions for banking and other competitive examination. In the above paragraph of Caselet DI, lots of information is given. You have to read the paragraph carefully and then you have to note down all the key information as short as possible. The given information will let you draw some diagrams such as Venn diagram, tabular chart or any other diagram. 1. How to draw a diagram on the basis of given information. 2. Which diagram is the need of the question? 3. Knowledge of Venn diagram. 4. Knowledge of the relationship between fractions and their percentage forms. 5. Knowledge of simplification and approximation. 6. If the question belongs to CI & SI or Profit & Loss or Speed, time and distance then you must have knowledge of basic formulae of these topics. 7. Must have knowledge of Ratio and Proportion. Guys, Smartkeeda Started New Platform Called Testzone which provides Best Test Series for all Bank, SSC and Insurance Exams. you must try its free mock test you will get to know by your self.